We went into Election Day with a hypothesis: Most Americans would cast a straight-ticket ballot — with some notable exceptions, which we’ll address in a moment. And we decided a good way to test this was to look at statewide races most likely to drive turnout in a midterm election cycle: U.S. Senate and governor contests. There were 22 states that had races for both the Senate and governor on the ballot this election cycle. And what we found was the same party swept both offices in 16 of the 21 states where each race has been called1, with Democrats capturing both races in 12 states and Republicans doing so in four. Or, in other words, our hypothesis was mostly right — most Americans did vote for the same party in their Senate and governors race. But there were five states — Arizona, Maryland, Massachusetts, Ohio and Vermont — where voters chose a Republican governor and a Democratic senator. To do this, I calculated the difference between the margin of victory in the Senate and gubernatorial races for each state using the Democratic and Republican vote shares in each contest.2 And as the table below shows, Massachusetts had the biggest difference between its vote share margin in its races for Senate and governor. Republican Gov. Charlie Baker won reelection by about 32 percentage points and Democratic Sen. Elizabeth Warren garnered a second term with a roughly 26-point margin, producing a gap of 57 points. So, in other words, in hyper-blue Massachusetts roughly 25 to 30 percent of voters cast ballots for both Baker and Warren.3 Two other states, Vermont and Maryland, also had very large differences between their Senate and governor races — about 55 and 47 points, respectively. Along with Massachusetts, these races all featured relatively popular incumbent Republican governors — Phil Scott in Vermont and Larry Hogan in Maryland — running in strongly Democratic states that easily reelected incumbent Democratic senators. The popularity and independent streaks of these GOP governors clearly helped them overcome the sharply Democratic leans of their states. Election data as of 10 a.m. on Nov. 16, 2018. Only states with both a Senate and gubernatorial election that featured candidates from both major parties are included. This means California is excluded because no Republican candidate qualified for its Senate election. Florida is also not included because both its Senate and gubernatorial elections are still uncalled. Some data may not add up due to rounding. *Vermont Sen. Bernie Sanders and Maine Sen. Angus King are included as Democrats because they caucus with the party in the Senate. ‡Minnesota is included twice because it had two Senate elections this year. But these three states were notable outliers — no other state had a difference between their Senate and governor races that was greater than 17 points. That said, these less divided contests can still show you where a stronger candidate for one party may have made a difference. Take Tennessee’s Senate race, for instance. Republican Rep. Marsha Blackburn defeated Democrat Phil Bredesen there, but Bredesen — a popular former governor — made the Senate contest notably closer than the gubernatorial election. Incumbency may have been a factor, too. Both the Tennessee Senate and gubernatorial races were open seats, but in another GOP-leaning state like Ohio, there was one incumbent on the ballot, which might help explain why Ohioans elected a Democratic senator and a Republican governor. Incumbent Democratic Sen. Sherrod Brown won his race by about 6 points and Republican Mike DeWine won the open-seat governor race by 4 points. Given that Ohio is 7 points to the right of the country, Brown probably benefited at least some from an incumbency advantage The two races ran relatively close together — the difference was 11 points — suggesting that most voters voted for the same party in both contests. As you can see, even though 2018 has the lowest mark in the past three decades, the median difference from election cycle to election cycle has bounced around. Still, the overall trend is one of decline, at least since 1998. 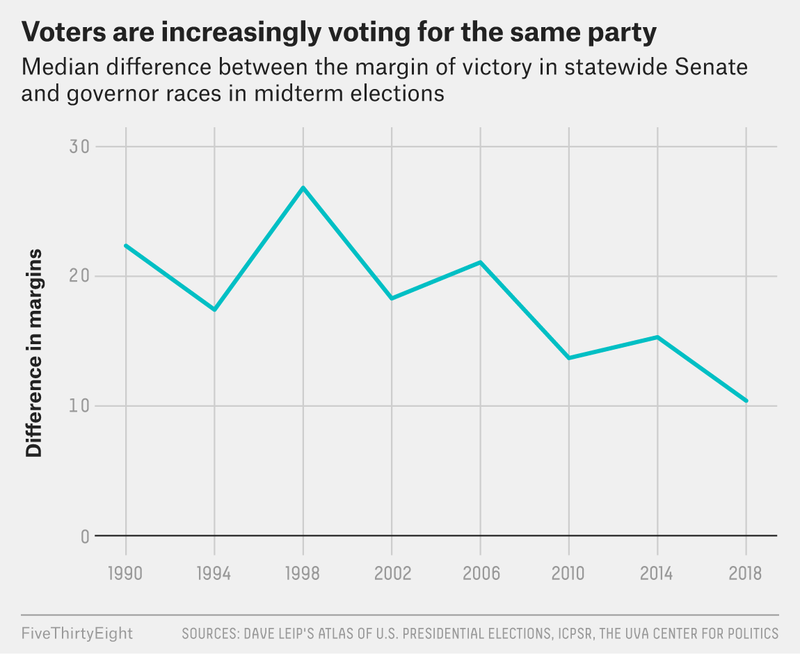 You might wonder why there are fairly regular ups and downs in the chart, but this can be explained by the number of elected governors running for re-election in each cycle. For example, only eight incumbent governors ran in the 24 states included in my calculations for 2010, whereas in the 2014 cycle there were 16 states with incumbent governors. And what I found was cycles with fewer incumbent governors running tended to show less evidence of split-ticket voting (a lower median) while cycles with more incumbents demonstrated more evidence of split-ticket voting (a slightly higher median). Part of this is because governors often benefit from an incumbency advantage. As my colleague Nate Silver pointed out in his introduction to FiveThirtyEight’s governor forecast, partisanship explains less in gubernatorial elections than it does in federal contests, and therefore, incumbency might matter slightly more for governors than it does in either the House or Senate. No matter which way you cut it, the difference between the margins in a state’s gubernatorial and Senate races has shrunk. More voters are casting straight-ticket ballots. There are exceptions, of course, but this shift matches what we know about the larger electoral picture: voters are more partisan and the country is more divided than it’s ever been in the modern era of U.S. politics. CORRECTION (Nov. 19, 2018, 2:30 p.m.): A table in an earlier version of this article incorrectly indicated that the Democratic Senate candidate in Arizona, Kyrsten Sinema, was the incumbent. The race was for the seat that Republican Sen. Jeff Flake is retiring from. In Minnesota, Democrats won the governorship and two Senate races thanks to a special U.S. Senate election. We excluded Florida from the count because at the time the analysis was conducted both the Senate and governor races were unresolved, but it is included in the historical analysis below. Maine and Vermont are included even though their senators are independents, as both caucus with the Democratic Party. I first subtracted the Democratic vote share from the Republican vote share (based on the overall vote, including third-party votes, as of 10 a.m. on Nov. 16) to find the margin of victory for each race. (Negative values signify a Democratic lead and positive values signify a Republican lead.) I then calculated the difference between the margin of victory in a state’s Senate race and its governor race. So if the margin in the Senate race was -25 (so D+25) and the margin in the gubernatorial race was +5 (so R+5), the overall difference was -30 (meaning the Senate race margin was 30 points more Democratic). We’re showing the absolute value of the difference because we’re trying to show which state’s races had the largest difference in margin regardless of which party the difference leaned toward. We excluded California because it did not have a Republican in its Senate race. According to FiveThirtyEight’s partisan lean metric, Massachusetts is 29 points more Democratic than the country as a whole. There was an independent candidate in the Senate race but no third-party candidates in the gubernatorial contest. So some voters cast ballots for the independent in the Senate election and then either Baker or his Democratic opponent in the gubernatorial race. For the 1990 to 2018 period, I excluded cases where a third-party candidate won or finished second in a state’s Senate or gubernatorial contest, or cases where no Democrat or Republican contested one of the offices. This calculation does include Florida because it isn’t the party lean of the margin we’re interested in; we just want to show the difference between the margins in the Senate and gubernatorial contests, and we’re dealing with small margins either way the races are called (at the time the analysis was conducted, both races were uncalled).